Over the last few years, international volunteering, volunteer tourism or ‘voluntourism’ has caught momentum and seen an exponential growth with an increasing number of people wanting to ‘do good’ whilst on their holidays. Despite increasing criticism of some questionable and poor practices within the sector, our first-hand experience shows that volunteering can be a rewarding and eye-opening experience that can be beneficial both for the individual volunteers and for the local communities if it’s done responsibly. Volunteering abroad has the potential to facilitate cultural exchange, support the protection of wildlife and biodiversity, preserve cultural heritage and contribute to social infrastructure and welfare. Many people already volunteer in their home country and volunteering abroad has the potential to facilitate cultural exchange, support the protection of wildlife and biodiversity, preserve cultural heritage and contribute to social infrastructure and welfare. Assuming the volunteer organisers and volunteers themselves adhere to Responsible Tourism practices, volunteering abroad will also contribute to local economic development and benefit the triple bottom line in the destination. Good intentions are, however, not always enough, and, if projects are managed poorly, evidence suggests that well-meaning volunteers actually can create more harm than good – even with the very best of intentions. Recent press articles, blogs and online forums discussing volunteering and ‘voluntourism’ have focused on poor practices within the sector and how voluntourism and short-term volunteering with children can create dependency, cause emotional distress, provide short term fixes in preference to long term solutions and increase the risk of human trafficking, violence and sexual abuse. In Cambodia, for example, the number of orphanages has increased almost proportionally with the number of tourist arrivals over the last decade. Many organisations do a significant job in dealing with social issues and the increased number of orphanages attract well-meaning tourists and potential volunteers, but, unfortunately, children’s centres, orphanages and residential institutions, also attract those with more questionable intentions. Establishments without any child protection policies in place are more at risk for abuse, and there are examples of establishments with poor living conditions actively being maintained to attract more sympathy and donations from well-meaning travellers. In addition to this, children are also sent out on the streets late at night to sell books, flowers and beg for money – something of which put the children in potentially dangerous situations. In response, ChildSafe International and Friends International have launched several campaigns to create more awareness about some of the issues regarding orphanage tourism and encourage potential visitors to think before they consider visiting an orphanage during their travels. Having lived, worked and travelled extensively in developing countries, we have seen many of these issues first-hand. We do, however, appreciate that it’s very easy to feel compelled to help, but we’ve also seen some of the unintended consequences of donations and well-meaning volunteers. Therefore, we would strongly encourage everyone to do some research and read up on some of the potential impacts before their travels and particularly so when considering volunteering with children. There are lots of guidelines and codes of conduct available – both for volunteers and volunteer sending organisations – many of which we think provide lots of useful tips and advice. Ensure that the projects have been identified by host partners and communities with realistic aims and objectives. Make sure your expectations correlate with those of the organisations you will be working with. Be realistic in regards to where you will learn and where you will add value. Ongoing support appropriate to the placement and volunteer. Ensuring protection, safety and well being of volunteers and those they work with. Can I really save the world in a couple of days? Unfortunately, no. We’d love to be able to save the world in a couple of days ourselves, but what we can do is provide you with lots of responsible travel tips (of which we hope you will share with your friends, family and fellow travellers). We can also put you in touch with vetted organisations that will help you learn more about the destinations you are travelling to and tell you more about the impacts of the volunteer trips on offer. What's your take on 'orphanage tourism'? Most people want to travel responsibly and ‘do some good’ whilst travelling. Unfortunately, some unscrupulous people take advantage on their generosity and genuine want to do good. For some, ‘a visit to an orphanage’ has even become an integral part of the tourist trail without thinking about the potential consequences. 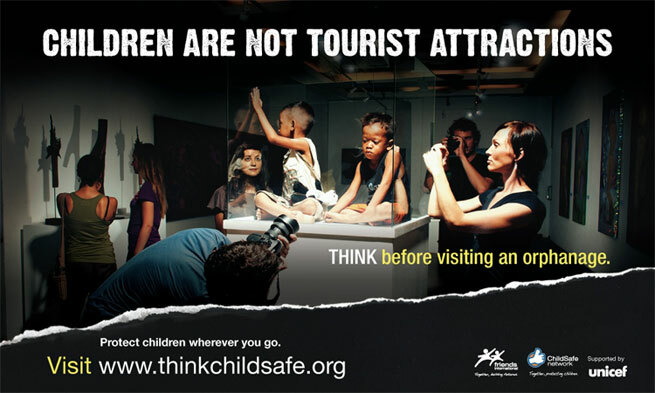 We don’t think children should be tourist attractions and, therefore, we strongly encourage people to do some research and learn more about the unintended consequences of people visiting (and volunteering at) orphanages. If in doubt, chances are that there are better ways to use your enthusiasm and benefit the local community.